Colorado’s changing climate poses health risks – now and into the future. Studies show that climate change and health are linked. 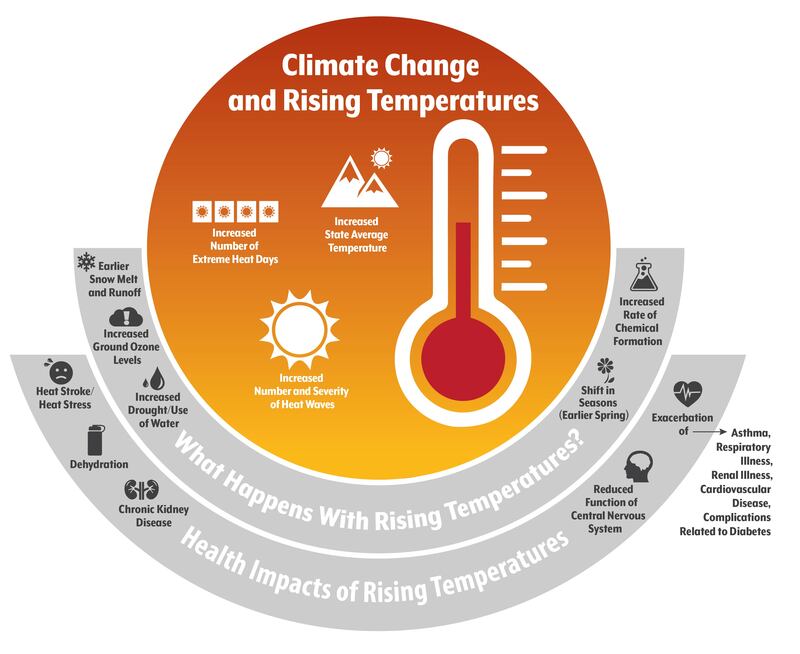 Rising temperatures, polluted air and extreme weather, among the most impactful results of climate change, threaten both physical and psychological well-being.10 Children, seniors and people with lung or heart disease are especially at risk. Coloradans are witnessing climate changes in various forms. At the state level, Colorado’s voters passed a law in 2004 creating first-in-the-nation renewable energy standards for electricity producers, which has placed Colorado among the leaders in renewable energy. The state's 2007 Climate Plan, created by former Gov. Bill Ritter and updated in 2015 by Gov. John Hickenlooper, calls for regulating greenhouse gas emissions (GHG), conserving water and encouraging community-level action. Colorado is one of 33 states and the District of Columbia with a climate change plan. Four Colorado cities — Aspen, Boulder, Denver and Fort Collins — have adopted local climate action plans. 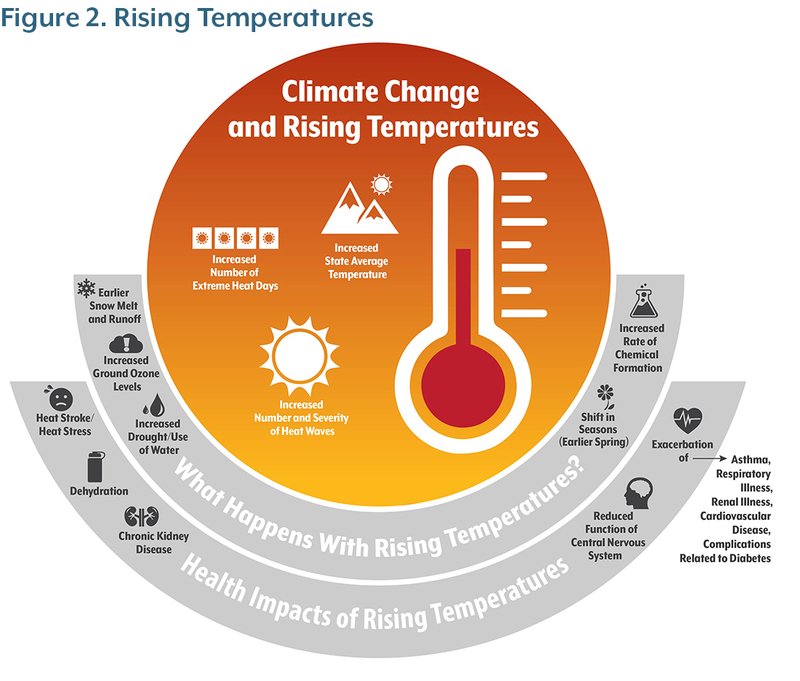 This brief delves into the health impacts of three climate-change factors relevant to Colorado: rising temperatures, worsening air quality and extreme weather. It identifies Coloradans who will be most impacted by climate change and looks at the policy actions underway and the policy questions on the horizon. Colorado, as a landlocked state with complex landscapes ranging from mountains to plains, experiences climate-related events differently than other states. Extreme weather events such as blizzards and droughts are more common in Colorado, while hurricanes and flooding impact coastal states such Louisiana and Florida. The consequences of climate change tend to be interconnected. Rising temperatures are likely to impact Colorado’s most valuable natural resource — water. Snow accounts for 70 percent of the state’s surface water supply.17, 18 As snow melt drains from the mountains earlier in the spring due to higher temperatures, less water is available later in the year to feed forests and meet agricultural and human needs. Meanwhile, as Colorado’s climate warms, forests dry out. Thirsty forests, in turn, are ripe for wildfires. Smoke and dust from fires pollute the air. And dirty air is a health hazard, particularly for people with breathing difficulties. 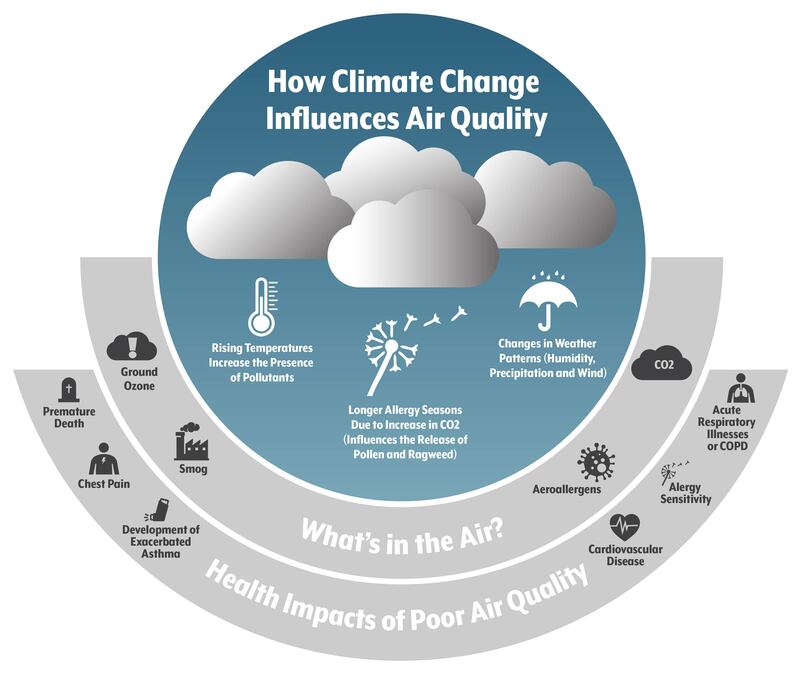 The following sections delve into the three climate change results that are expected to most affect the health of Coloradans, according to a synthesis of the research. Colorado’s average temperature has varied over the past century. Scientists have established a baseline temperature based on a 30-year average. (See Figure 1.) They plotted the annual average temperature relative to that average from 1900 to 2012. 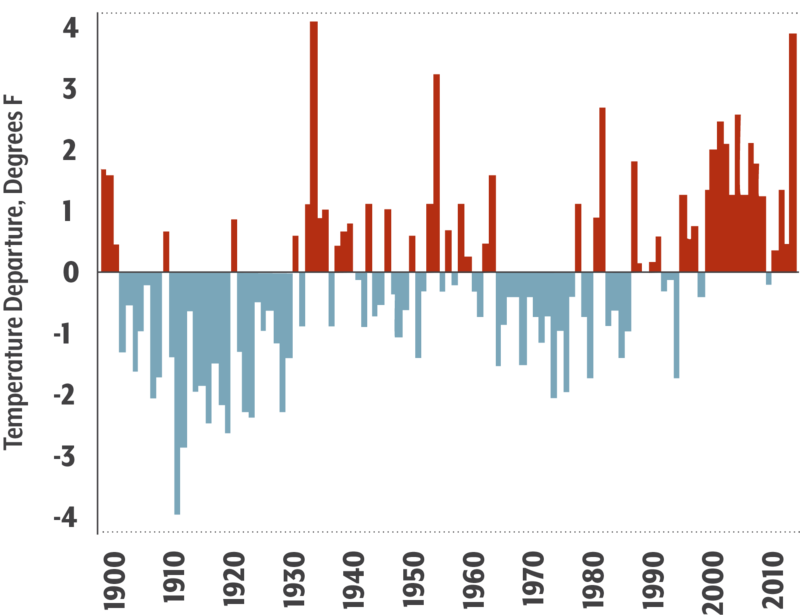 The blue bars represent years when the average temperature was below the 30-year baseline. Red bars mark years when the average temperature rose above the baseline. Colorado’s temperature spiked during the Dust Bowl in the 1930s and again in the 1950s. Temperatures began to be consistently higher than the average beginning in the mid-1990s. 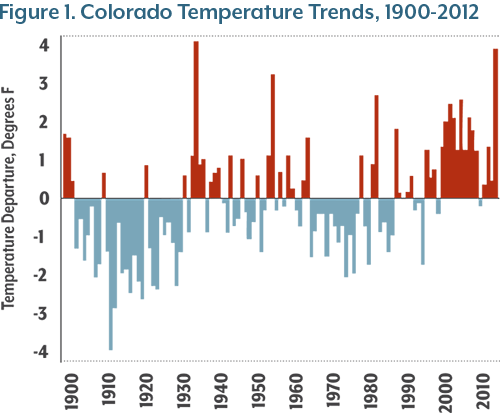 Colorado’s average temperature has increased by two degrees Fahrenheit in the past 30 years. Looking ahead, climate models indicate a warmer future for Colorado. Projections say the state’s average temperature could be five degrees higher by 2050.20, 21 Such increases significantly outpace historical trends. Almost six percent of Colorado’s adults have cardiovascular disease, putting them at an increased risk for heat exhaustion and heat stroke. A weakened heart has a harder time pumping blood throughout the body to normalize temperatures. The 711,000 seniors over age 65 are at increased risk because chronic illness and age can hinder the ability to regulate body temperature. Ozone is a lung irritant, meaning that high levels can cause breathing problems. Pollutants such as particulate matter and carbon dioxide (CO2) can cause or exacerbate allergies. Warmer temperatures and an increased presence of CO2 promote growth of plants that release airborne allergens. 44 This seasonal shift could extend the allergy season. Seniors with bronchitis or emphysema. The approximately 380,000 adults with asthma. The 180,000 Colorado adults with respiratory ailments such as Chronic Obstructive Pulmonary Disease (COPD). Thirsty forests are a welcome environment for the invasive bark beetle, which has destroyed 3.4 million acres in Colorado since 1996.49 Those dead trees, in turn, are volatile fuel for wildfires. Secondary impacts such as induced asthma attacks, coughing, chest pain, eye and nose irritation may be felt by residents living farther away because of smoke’s ability to travel long distances. Many climate change policies, research and programs originate at the federal level. The United States Department of Agriculture, the Department of Health and Human Services and the Department of Energy are among the federal organizations that develop or enforce climate change-related policies, studies and programs. The EPA is the primary organization that creates and implements most of the nation’s climate-related policies, including the Clean Power Plan, the National Environmental Policy Act, the Clean Water Act and the Clean Air Act. The overarching goal is to protect the environment by limiting pollutants and emissions, setting standards and requiring environmental assessments and impact statements before building new infrastructure. The Clean Power Plan (CPP), finalized in 2015, aims to reduce carbon pollution from power plants. But its fate is uncertain. West Virginia, 27 other states — including Colorado — and hundreds of organizations sued the EPA, claiming the requirements of the CPP are unconstitutional. President Trump in March signed an executive order calling for EPA Director Scott Pruitt to begin dismantling the regulations. Colorado, meanwhile, is creating climate change policies, ordering studies of the effects of a changing climate and developing evidence-based recommendations and guidelines. Colorado voters approved the Renewable Energy Standard in 2004 requiring investor-owned electricity providers — such as Xcel Energy — to obtain 30 percent of their energy from renewable resources by 2020. Renewable resources may be solar, the result of anaerobic digestion, recycled energy, landfill gas, wind, hydropower, geothermal, pyrolysis, coal mine methane or woody biomass. Ritter’s plan called on state agencies, private utility companies, businesses and individuals to engage in initiatives such as recommending efficient energy use in households, setting recycling goals, changing farming practices and increasing clean transportation. At the local level, Denver became one of the first large American cities to develop its own climate action plan in 2007, setting a goal of reducing greenhouse gas emissions by 10 percent per capita below 1990 levels. Since then, the city has released three updated plans, including one in 2015 which calls for reducing emissions by 80 percent by 2050. Denver conducts an annual “GHG inventory” to evaluate emissions levels and progress in reduction efforts. The plan calls for Denver’s building and energy sector to change how structures are built and identify energy efficiency strategies. Other Colorado cities taking steps to address climate change include Aspen, Fort Collins and Boulder. Each has created a climate action plans similar to Denver’s. State and local governments may work under the guidance of or directly with the EPA to implement policies. State Implementation Plans (SIPs), required by the Clean Air Act, are an example of how states comply with federal guidelines. States identify in their SIPs how they will attain or maintain the National Ambient Air Quality Standards which are revised by the EPA every five years. Currently, the EPA is facing a 31 percent budget cut under President Trump’s budget proposal. This will make it hard to regulate environmental offenders and provide technical assistance to states. The Colorado legislature passed House Bill 13-1293 in 2013, calling for the executive branch to provide periodic updates on the climate change plan. Governor John Hickenlooper released Colorado’s most recent climate plan in 2015, focusing on seven sectors — water, public health, agriculture, energy, transportation, tourism and recreation — and making recommendations to mitigate and adapt to climate change. The recommendations range from implementing the federal Clean Power Plan to training local governments on environmental hazards. The plan identified mitigation initiatives such as reducing the emission of harmful pollutants such as particulate matter, ozone, and nitrogen dioxide. 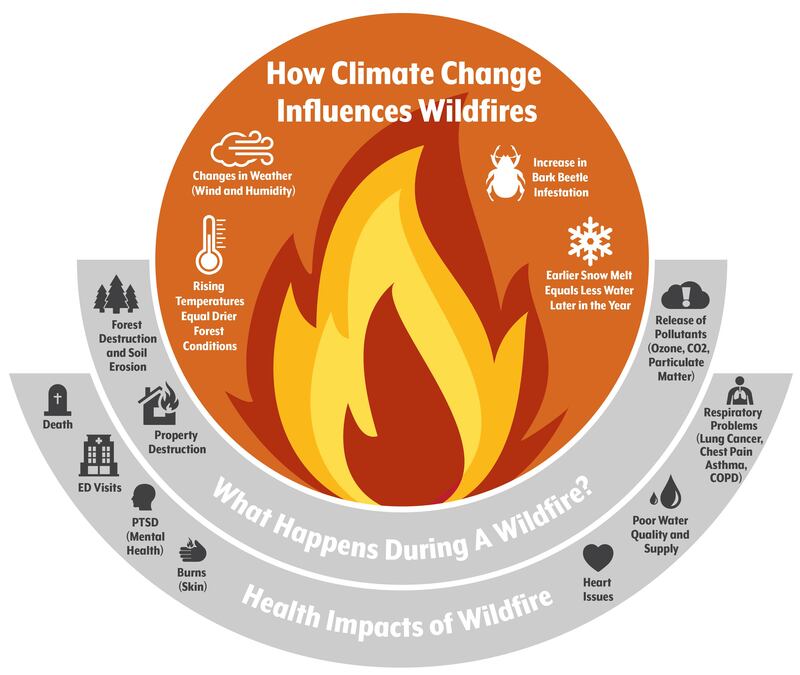 Adaption strategies include creating early warning systems and emergency response plans to notify communities about wildfire danger, flooding, and impending extreme weather. The state plan also called for preventive maintenance such as updating infrastructure like dams and reservoirs. The plan was a collaborative effort by the Colorado Energy Office, the Colorado Department of Public Health and Environment, the Colorado Water Conservation Board, other agencies and private organizations. Researchers from local universities provided evidence that helped shape the policy recommendations. The Western Water Assessment group, for example, collaborated with Colorado State University and the University of Colorado Boulder to create the Colorado Climate Change Vulnerability Study — a report that summarized potential challenges for each of the seven sectors identified in the 2015 plan. The study provides each sector with recommendations for adaptation strategies, including creating water-specific climate change vulnerability assessments for surface and groundwater supplies and a statewide plan for the energy sector that outlines the cascading impacts of drought on energy use. Higher temperatures, worsening air quality and more wildfires place the health of all Coloradans at risk. This report highlights the adverse health effects of climate change – from aggravated asthma and allergies to dehydration and heat stroke. Colorado’s 1.2 million children and 711,000 seniors are especially vulnerable, as are people with chronic conditions such as diabetes and cardiovascular disease. The good news is that Colorado, in many ways, is leading the way when it comes to health and climate change. Coloradans have set standards for using renewable energy resources. Initiatives to reduce emissions are being implemented at the state and local level. Communities are preparing for extreme weather, adopting emergency response plans. 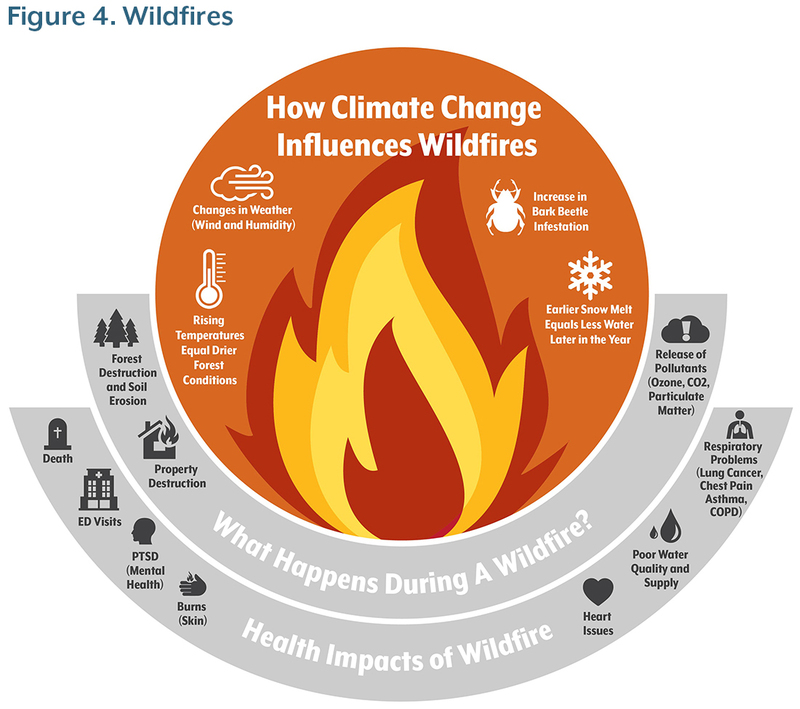 Strategies from the Colorado Climate Change Plan have set the stage for government agencies, researchers, and organizations to collaborate on addressing this threat to human health. This work to address climate change has an important goal: helping to improve the health of all Coloradans. 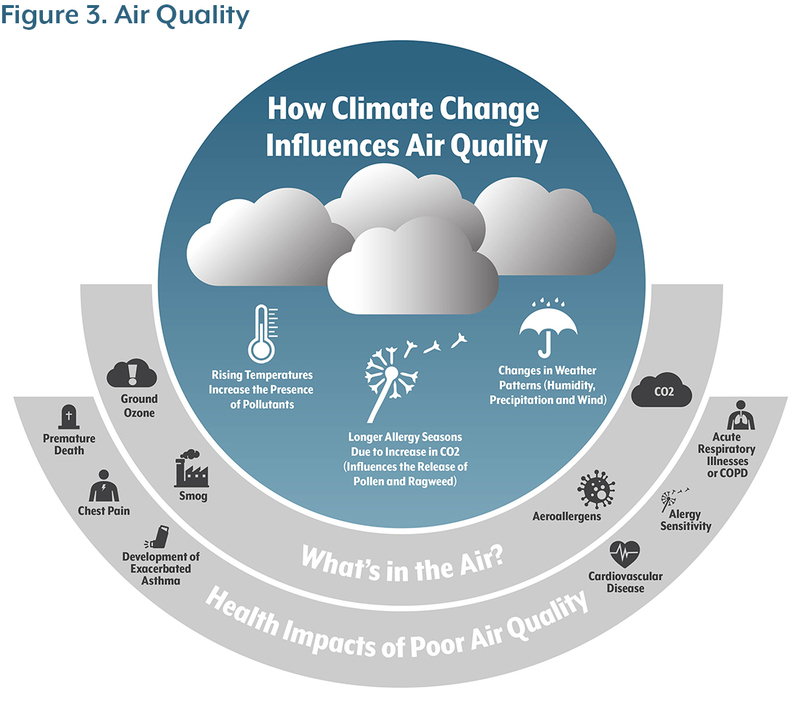 This paper marks the first research done by the Colorado Health Institute into the impact of climate change on health. It was prompted by the growing body of scientific research connecting the two. The Colorado Health Institute is an independent, nonpartisan health policy research institute with a mission to provide evidence-based insight and analysis to support sound health policy decision-making. Climate Change Adaptation refers to actions to lessen the impact on health and the environment (of climate change) that can’t be prevented through mitigation. Examples include health advisories for anticipated disease outbreaks or heat waves. Climate Change Mitigation refers to actions to reduce greenhouse gas emissions and to enhance the environment’s ability to take carbon dioxide out of the atmosphere.2 Mitigation strategies include constructing energy efficient buildings, public transit systems and increasing the use of renewable energy. Ozone is an air pollutant created by chemical reactions that happen in the presence of sunlight. It can be good or bad for health, depending on its location in the atmosphere. Ground ozone is part of the air we breathe. It affects lung function, causes airway inflammation, coughing, throat irritation and other respiratory problems. Ozone high in the atmosphere — six to 30 miles above the ground — protects the Earth from harmful ultraviolet rays. Chrissy Esposito, who joined the Colorado Health Institute in May 2016, is the Data Visualization and Policy Analyst.